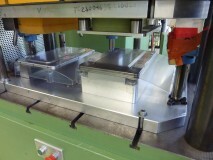 Thermoforming for products such as etuis, moulded cushions, protective covers, etc. Thermoforming moulds soft and hard foils into the desired shape. Heat, vacuum force and pressure are perfectly balanced with one another, depending on the desired shape and the materials used. Post-processing includes steps such as stamping, milling and finishing with accessory components.